It’s that time of year when Leeds City Varieties becomes home to the region’s favourite pantomime with a rock ‘n’ roll edge. This season, experience the classic tale of Cinderella — retold through chart-hit numbers, classic stage magic and slapstick comedy that the whole family will enjoy. 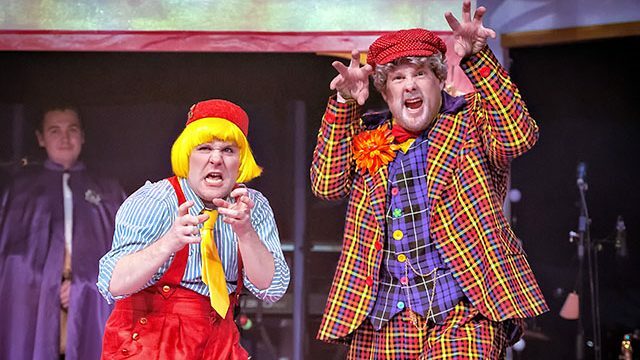 Now in its eighth incarnation, The Rock ‘n’ Roll Panto stands out brightly amongst other seasonal pantomimes. This is partly thanks to a multi-talented cast who not only provide all the dramatic action, but also perform all of the musical elements too. The whole panto is a perfect demonstration of clockwork chaos; performers one minute deliver slapstick comedy and the next, perform slap-funk bass. It’s a busy and enthralling stage musical experience, showcasing the abilities of a compact cast within an intimate venue — telling a tall tale with a big showstopping sound. There’s also a great feeling of nostalgia and tradition when watching a panto as well made as Cinderella within Leeds City Varieties — a truly beautiful theatre which is world-renowned for its music hall legacy. Panto is about as close as we can hope to get to that Victorian staple today, and the Rock ‘n’ Roll Panto makes ingenious use of its jewel-like space to bring depth and scope to its fanciful, fairytale landscape. Kenny Davies as Buttons and Dyfrig Morris as Baron Hardup. Credit: Anthony Robling. Some familiar faces return to the show this year, including Kenny Davies in his eighth appearance, this time playing a brilliantly buoyant Buttons. Dyfrig Morris also rejoins the cast as a bravura Baron Hardup, showcasing a saucy stand-up routine which is bound to delight adults as much as kids. 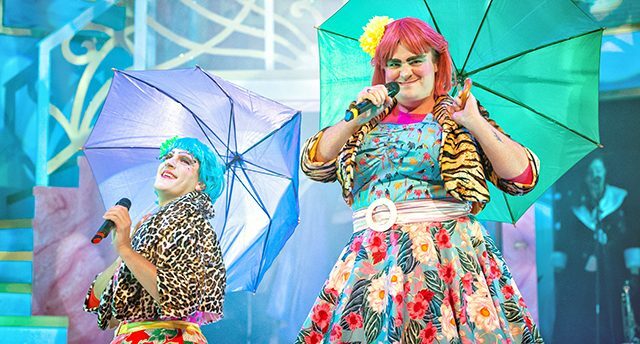 One of the show’s biggest boons is the grotesque recreation of the Ugly Sisters, brought to life in a hilarious double act from Matthew James Hinchliffe and Scott Haining. The pair draw on west country accents and a vibrant wardrobe to make a startling, unfettered impact. There’s absolutely no attempt to make Hernia and Veruca dainty or delicate, opting for a butch, flat-footed attack which is guaranteed to steal every scene. Their version of It’s Raining Men has to be seen to be believed. Matthew James Hinchliffe and Scott Haining step-sisters Hernia and Veruca. Credit: Anthony Robling. At its heart, children are most likely to be drawn to the fairytale magic of the story itself, which is brought to stage in a lean and focused book from Peter Rowe, resourcefully integrating popular musical numbers into every beat. Alex Wingfield and Grace Lancaster hand over enchanting performances as Prince Charming and Cinderella, who will doubtlessly inspire young imaginations, whilst Rachel Nottingham delivers some much welcome seasonal sparkle as the Fairy Godmother. Alex Wingfield as Prince Charming and Grace Lancaster as Cinderella. Credit: Anthony Robling. Notable mentions must also go to Tom Conner as a flash and funny Dandini, and Katia Sartini who is the perfect villainess, Rubella De Zees. In a smart local flourish, Leo Elso plays the dashing Messenger from Harrogate. Nice. The basis of this pantomime’s ongoing success is its heavily-resourced pool of talent, demonstrated through engaging performances with inventiveness, charm and warmth. 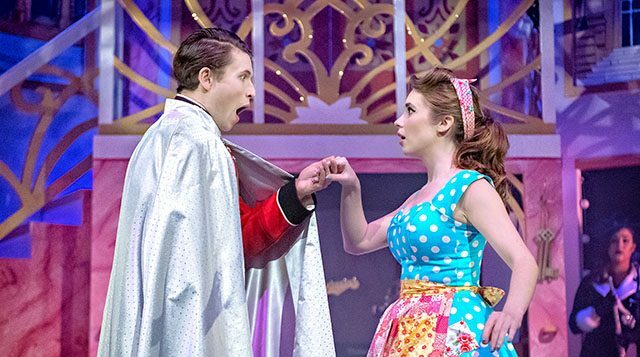 If you’re going to see one traditional panto this year, make sure it’s Cinderella at Leeds City Varieties — an authentic knockabout musical which vividly honours the venue’s historic pantomime legacy. Cast: Grace Lancaster, Alex Wingfield, Kenny Davies, Dyfrig Morris, Tom Connor, Katia Sartini, Rachel Nottingham, Leo Elso, Scott Haining, Matthew James Hinchliffe. Director: Matt Aston Writer: Peter Rowe Theatre: Leeds City Varieties Running time: 120 minutes Dates: Friday 30 November 2018 – Sunday 13 January 2019.